Victorian Acres, Nebraska City 2011. Camping at Victorian Acres, Nebraska City, NE 2012. 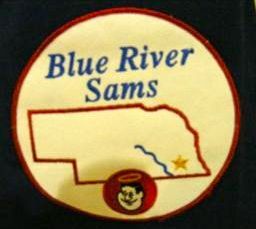 Blue River Sams at the newly opened Kregel Windmill Factory Museum, Nebraska City, NE May 14, 2013. Thursday, June 6, 2013, Parade of Flags at the Nebraska Samboree. 7:00 a.m., Friday, June 7, 2013. Ready to help with the Free Pancake Breakfast at the Nebraska Samboree. Saturday, June 8, 2013 Selling 50/50 raffle tickets at the Nebraska Samboree. Thursday, June 5, 2014 Parade of Flags at the Nebraska Samboree. 7:00 a.m., Friday, June 6, 2014. Blue River Sams servers at the Free Pancake Breakfast at the Nebraska Samboree. Thursday, June 4, 2015 Parade of Flags at Nebraska RV Rally.